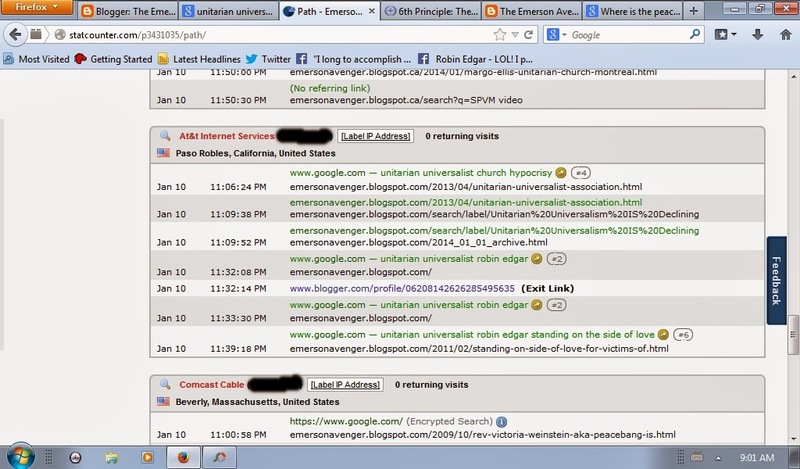 The Emerson Avenger: Unitarian Universalist Church Hypocrisy And "Less Than Inspiring" UUA Membership Statistics - What's The Connection? Unitarian Universalist Church Hypocrisy And "Less Than Inspiring" UUA Membership Statistics - What's The Connection? How about the readily verifiable fact that a free and responsible Google search for the Truth and meaning of. . .
Unitarian Universalist Association Membership Statistics For 2013 Are "Less Than Inspiring". . .
and then spent over half an hour of their precious time engaging in a free and responsible search for the Truth and meaning of as to why. . .
Of course there is MUCH more to the interconnection between Unitarian Universalist "church" hypocrisy and the readily verifiable FACT that less than 200,000 North Americans deign to join a Unitarian Universalist "church" aka a "Less Than Welcoming" Welcoming Congregation of the Unitarian Universalist Association of Congregations. In fact only about half that many card-carrying Unitarian Universalists even bother to attend a hypocritical Unitarian Universalist church on any given #UUSunday. . .
For a VERY recent example of Unitarian Universalist "church" hypocrisy here is a link to my blog post about how Unitarian Universalist "church lady" Margo Ellis flagrantly flaunted MOST if not ALL Unitarian Universlist principles and ideals by not only physically assaulting me last #UUSunday, but then apparently decided to commit the crime of public mischief by making a false report to Montreal's SPVM police force falsely accusing me of assaulting her by pushing her to the ground, when I had done no such thing. Where is the justice, equity and compassion in human relations in *that* U*Us? How does *that* honour and uphold Unitarian Universalism's 6th principle which calls upon Unitarian Universalists to work towards the goal of world community with peace, liberty and justice for ALL? DO tell U*Us. . .
And, needless to say. . .
*That* little incident last #UUSunday is FAR from being the only, or indeed WORST, example of outrageous hypocrisy on the part of Unitarian Universalist "church" goers, to say absolutely nothing of outrageously hypocritical U*U clergy and UUA leaders. . . that Yours Truly can and WILL present to both the UU World, but also the real world in mainstream media in the coming weeks and months.